After a summer of racing in the local French events, Ben and I decided to head over to Italy to compete in the qualifier event for the Amateur world champs. The UWCT which is the governing body for amateur road cycling hold a world tour each year made up of events in 12 different countries with the top 25% of athletes going through to compete for rainbow stripes in World Finals. For us living in the French Alps, our nearest qualifiers we either La Look in Nevers France or La Leggendaria Charley Gaul in Trento Italy. 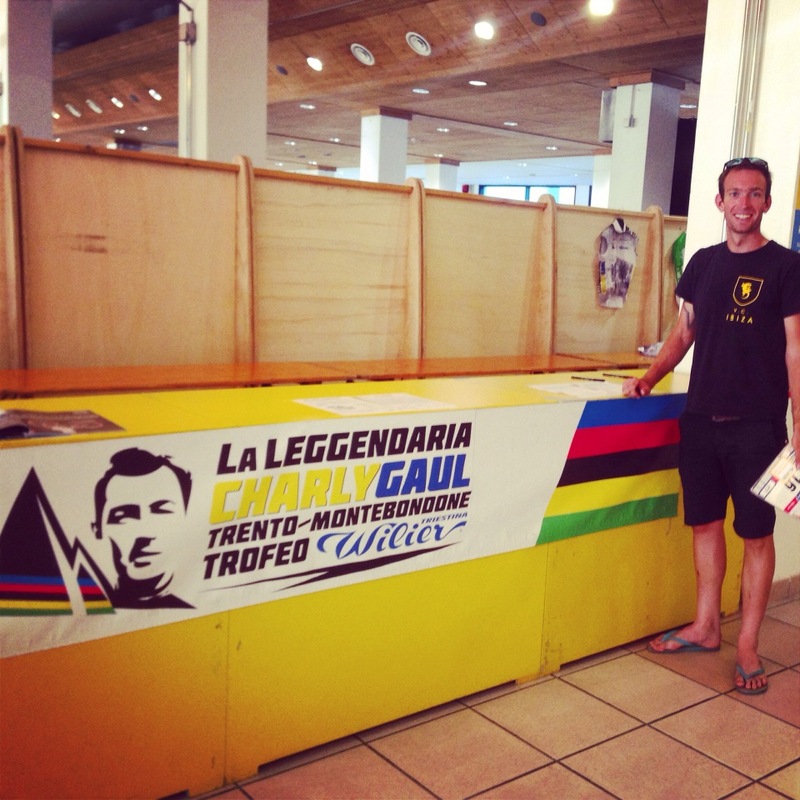 The French event is held early in the season – May so we decided to head over the boarder and try our luck in Italy. The event is awesome and so well organised, spread over 3 days with a Friday evening time trial followed by a rest day then the Road race on the Sunday. When you arrive, there are signpost through the town directing you to a big sports centre where you collect your race numbers and timing chip. You are also given a big bag full of water bottles, pasta, energy bars, jam, fruit and all the information you need about the event. 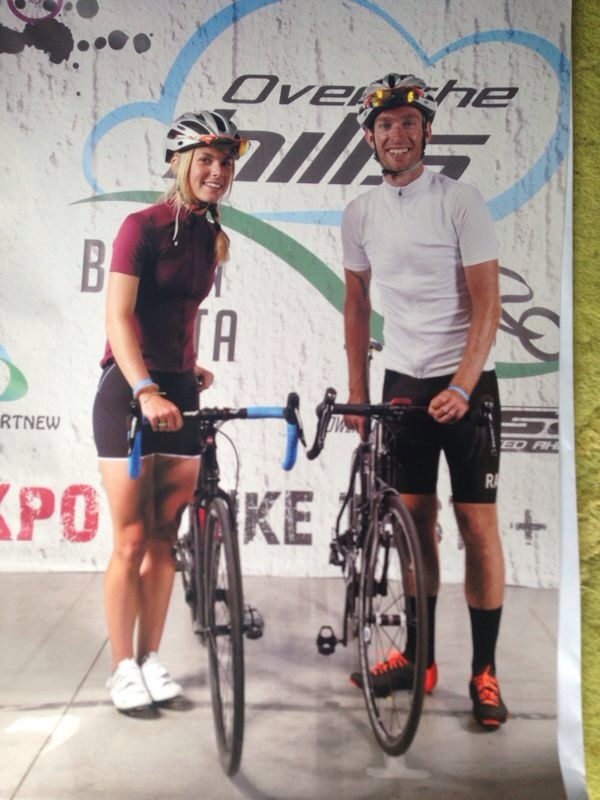 They also run a bike expo from the centre where you can test ride a range of bikes. Whilst in Trento we camped at a Agrotourism, which is a rural farm which provides cheap accommodation and amazing home-made local food and produce. It was perfect 5km from Trento which meant we could pedal in on the morning of the road race. The first part of the event – The time trial was held in a town called Cavedine just outside of Trento which is in the lake valley. The course was a 24km loop it started with a small climb before descending down to the lake, climbing back up then finishing on a long open (windy) flat. Neither Ben or I have ever done a trial trial course like this before, it was longer than anything we had ever done and much more varied. We both just went for it full pelt from the go and I think both suffered a bit on the climb, I didn’t know if it was possible to hit the wall on such a short distance but I think I came pretty close. We still have a lot to learn about time trialing. We rode our normal road bikes in our usual cycling kit, looking around and chatting to people was great we both want to do more time trialing so maybe at some point some more specific kit would be beneficial. Having said that we were both pleased with our results Ben came in 8th and I managed to get up of the second step of the Podium which I was super happy with! You have to wail for an e-mail invitation to the finals but if you get on the podium its a guaranteed qualification so I as through to the next round and we headed in to town for a beer to celebrate. The next day was a rest day so we used the time to scope out part of the road race course, stretch our legs with a short pedal and go swimming in the lake. We had a chilled evening and cooked some dinner at our Agrotouism then headed to our tent for an early night. Sunday morning was an early start 5am alarm, breakfast, dressed and pedal into Trento to the main square for the 8am mass start. 2500 people take part in the Charley Gaul. The start feels epic. There are 6 start pens one for pro’s and VIPS, then the elite men’s pen where you need to have some previous good results to get in, this is where Ben started, an all women’s pen which I was in then 3 more depending on when you signed up. There was a host of lead out motorbikes, music blaring and a helicopter hovering overhead. The atmosphere was buzzing, they do a countdown then start opening the pens and you are off – full speed weaving out of the town, the whole event is closed road and everyone is going for it trying to get up front and into the fast groups. People are going round both sides of roundabouts, bunny hopping curbs, over and undertaking. The whole race was fantastic and massively varied with something for everyone. It was 141km with 4000m of vertical assent with flat sections linking the climbs, narrow cobbled roads through small villages and even a section though a series of alleyways. The finish line was at the top of Mt Bandone on the Vason side, with a height of 1.650 meters an the same exact point that Gaul crossed in 1956. Ben made it over the line in 5hours 34 minuets coming 55th in his category and I wasn’t far behind with 5hours 48 coming 6th. It was a tough course with the final climb feeling gruelling to say the least. I was really looking forward to seeing Ben at the top so I think that’s what motivated me to keep on pushing up to the line. When I got there I was able to quickly find Ben, he was in the pasta party tent sitting with a tray packed full of food. We both sat and ate before descending back down the 38 bends which Mt Bandone is famous for and straight into a an ice cream shop. The chance to ride at a world class F1 and moto GP circuit is not something that happens very often, let alone one in Italy and with friends. The first ever Over The Hill Gran Fondo, held in the Imola GP circuit was being held at the same time we were in the region just north of Tuscany and with a good friend Stefano from @saddledrunk offering to look after us in his family’s nearby home, it was an opportunity that was far too good to pass up. It also seemed like the perfect end to our month long cycling trip where all the training, riding and touring could be out to the test to see how we were really doing. We signed up online a few days before the event to ensure that we got a space on the GF and along with the option of 102 or 162km event there was also a Time Trial option. Neither Gaby or myself had ever entered a TT before and though it might be a fun if painful 30minutes of bombing around an infamous circuit (making braap noises). 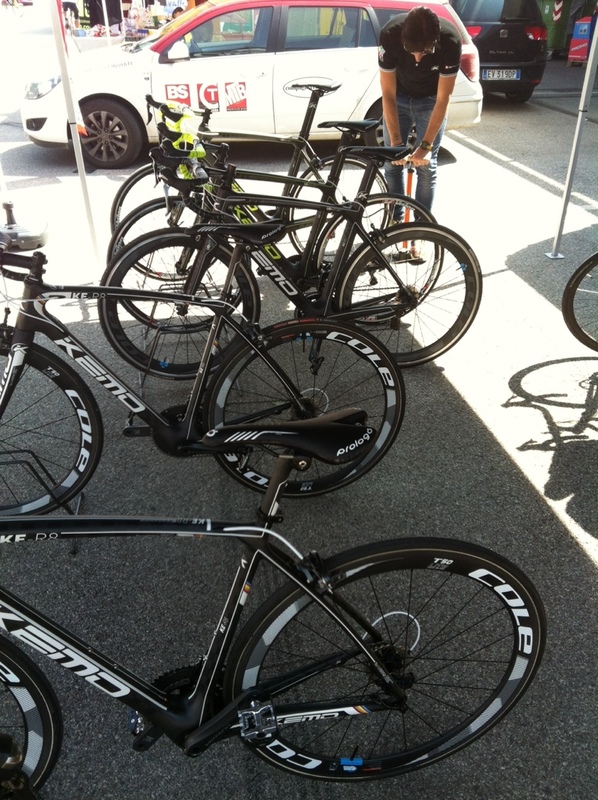 We did have one slight issue though, Gaby’s carbon bike had broken and she wasn’t able to use it. Our Charge touring bikes are built for massive mile munching and are perfect for that, but for a 15km TT they weren’t suitable so we went on the hunt for a bike to borrow! Almost instantly we stumbled across a company called Kemo who were demoing their top end race bikes and kindly lent us 2 to have a wiz round the circuit on! To say Gabs was ‘off like a rocket’ was a bit of an understatement. Riding her loaded touring bike for 150km a day for the past month had clearly helped as she shot around the course with me desperately trying up keep up and putting my heart rate through the ceiling. After returning to the demo arena with huge smiles, panting and explaining how impressed we were with the bike, the mechanics and owner (with a little persuasion) offered to lend Gabs the bike to compete in the TT. 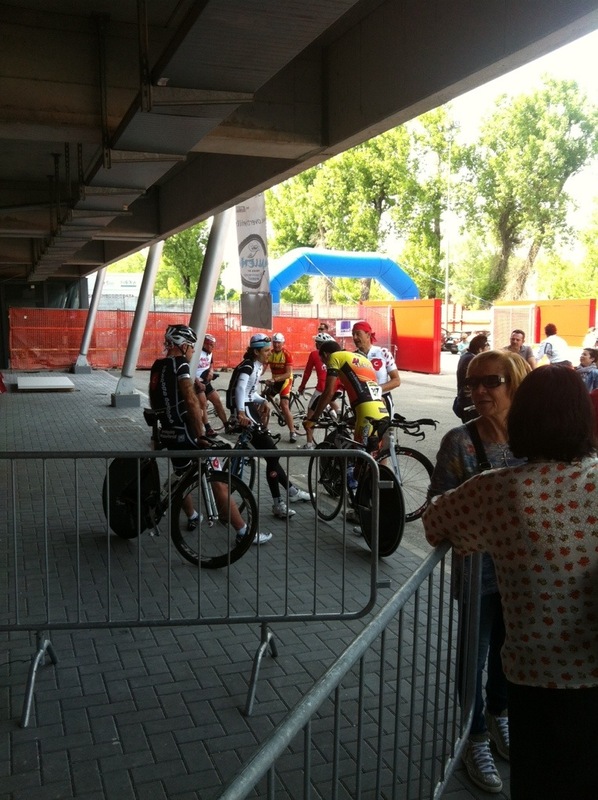 Numbers were hastily attached to the bike and jersey and off we went to the start line to eye up the competition! We were defiantly the odd ones out with ‘typically’ cycling clothing and helmets…no aero ‘sperm’ lids or over socks for us and certainly no TT bars or Disc wheels. The girls were up first and after 10 had set off with 1 minute intervals it was time for gofastergaby to show what she was made of. 3 Laps of the 5km circuit as fast as possible. We estimated that finishing in 30minutes would be a solid time. 30kph. After a flat out first lap and having over taken 2 people, Gabs looked in no way like slowing down, even taking time out to wave at the crowd and ‘ciao’ a few photographers on the way round. Well I suppose happy miles are fast miles after all! 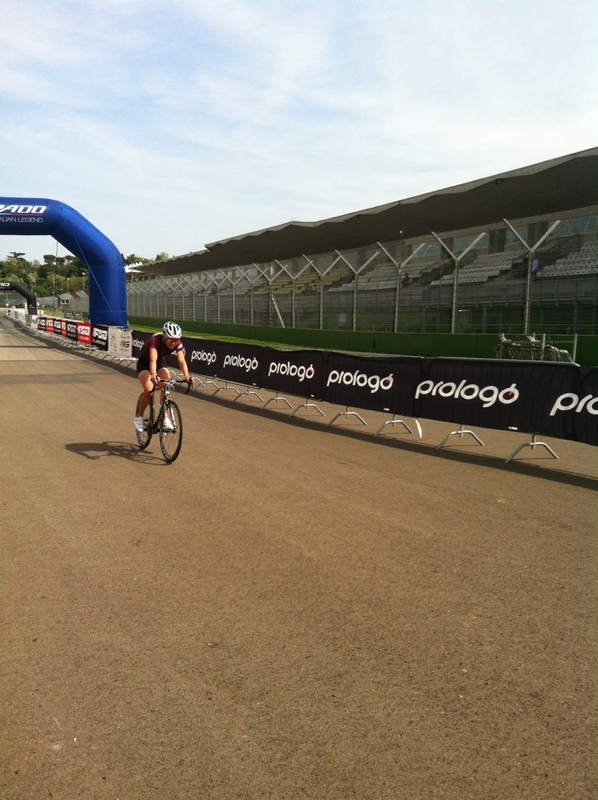 We still need to confirm the exact time but around the 25minute mark was her effort…and good enough to bag 3rd place. It also turns out that this event was a rather prestigious one as the winners received the Italian national jersey for their efforts! Next time Gabs…no waving and I wonder how she would do? Her prize for 3rd place…a huge Ham! Now if only more races rewarded success with charcuterie cycling would be the most popular sport in the world! 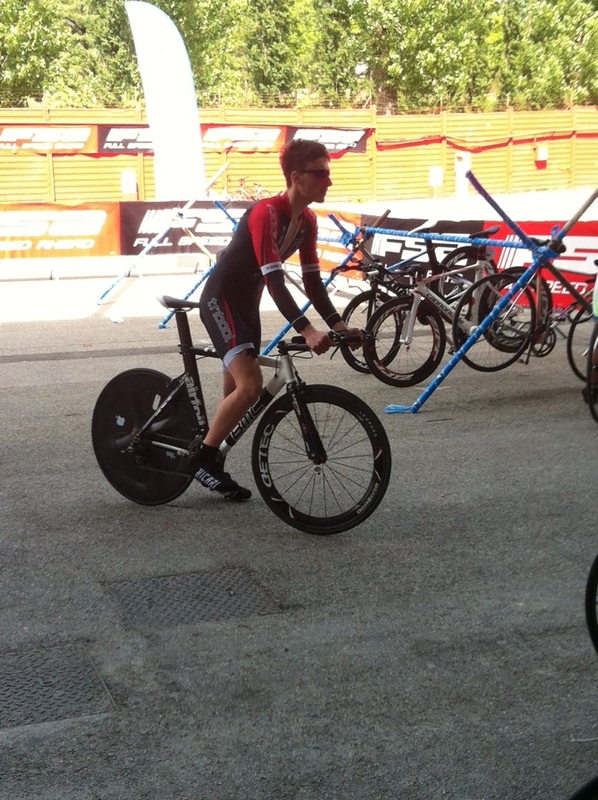 Even though I didn’t get on the podium I was very happy with my efforts. I managed to beat 30 people with funny helmets and big carbon wheels and got a time of 22minutes over the hilly course. …still a good day out, especially after pasta and Peronis!